The Solar Ship is a hybrid airship, gaining lift from both buoyant gas and aerodynamics. Its wing-ship design allows for short take-off and landing. This design also provides a large surface area for solar electric power, allowing long, self-sufficient range. The result is transportation without depending on things that often aren’t available in remote areas – fossil fuels, roads, or runways. 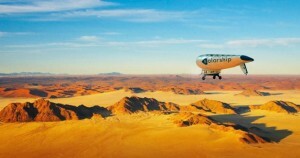 Solar Ship has now built and successfully flown its first airship. You should take a look at my 1980s novel SONGS FROM THE STARS, in which you will find the design for what I call the Solar Eagle, much the same thing as the Solar Ship, but as personal transportation more like an aerial motorcycle/bicycle, which allows for certain additional refinements. You should ask them for your royalties, Norman. Prob. get the same answer Arthur C Clarke got when he approached the satellite manufacturers, though, sadly.